Age Limit : Maximum age limit is 33 years for Post Graduate and 35 years for Post-Doctoral Degree holders. JIPMER Selection Process : Selection will be based on Written test/ Interview. Application fee : Candidate have to Rs.500/- (for UR & OBC Candidates) and Rs. 250/- (for SC & ST Candidates) through demand Draft drawn in favour of the “The Director,JIPMER” payable at State Bank of India, JIPMER Branch (02238), Puducherry-605006. How to Apply JIPMER Vacancy : Interested Candidates may appear for Interview along with prescribed application form with self-attested certificates/ testimonials and other relevant documents at the time of Interview. 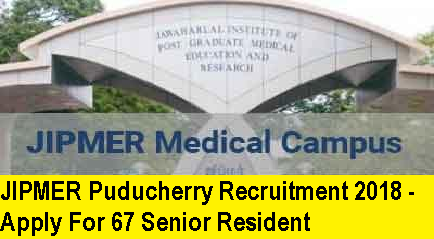 Jawaharlal Institute of Postgraduate Medical Education & Research (JIPMER) invites Applications for the posts of 67 Senior Resident.